Vegetal Alternative to Savoury Cheese. 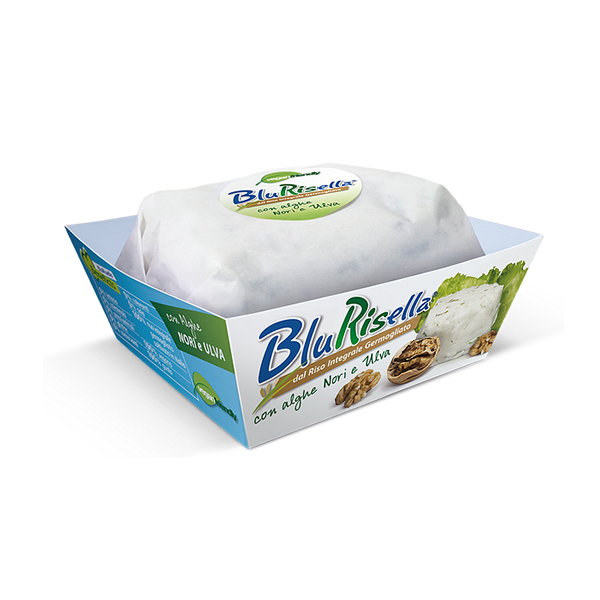 BluRisella is a delicious alternative to sauvory cheese, such as veined cheese, preservative and colourant free. Freshly prepared with the addition of Nori and Ulva algae. Ideal for those who don’t want to give up traditional taste. BluRisella is a plant-based alternative to spreadable cheese. Fresh, pasteourized and without preservatives and colourants. The core ingredient is Germinated Whole Rice, certified by EU of Organic Agriculture origin. The remaining ingredients are all natural and choosen for being top quality natural origin only. Not a single synthesis molecule or compound is used during its preparation. The wrapping paper is made of 100% biodegradable materials so you can throw it in the organic bin. A little tip that moves along with our company ethics which tries to respect as much as possible nature and preserve the enviroment. Just like all of other Verys products this plant based cheese is suitable to everybody, specially to whom has milk, lactose, gluten or soy intolerance. Due to it’s special soft consistency it is advised to whom is experiencing mastication issue. It is a tasty and genuine food, ideal for smart appetizer or to blend pasta and rice dishes. Our chef suggests you to try it with chicory and nuts, in savory pies and for all those snacks such as sandwiches and tramezzini. Use it to garnish veggie dishes or cereals or spread it on crackers or bread.